Need help adding a wired flow meter to your Rachio 3? Go here! While the flow sensors listed below are manufactured by BADGER, CST, or TORO, Rachio is NOT affiliated or authorized by these entities. This article is intended for instructional and compatibility purposes only. Please note: The Rachio Generation 1 Smart Sprinkler Controller is not compatible with wired flow sensors. For the best in flow monitoring and leak detection, we recommend the Rachio Wireless Flow Meter. Want to upgrade to a Rachio 3 with Wireless Flow Meter? Go here! Want to add a wired flow meter to your Rachio 3? Go here! To connect a flow sensor to your Rachio Generation 2 controller, please see the wiring diagram below (note the red & black wires MUST be installed correctly for the data to send to the controller). Either terminal "S1" or "S2" can be used for the flow sensor. Configuration in the app allows you to assign a rain sensor or a flow sensor to either terminal. 1) From the More tab, select "Accessories." 2) Select the sensor terminal you wish to configure - "Sensor (S1 Terminal") or "Sensor (S2 Terminal)"
3) Enable the sensor and select the type of sensor you're adding; in this case "Flow"
4) Select your flow sensor from the list. If the flow sensor is enabled via the controller settings, the usage reports in the mobile and web app will report in gallons. The gallons reported are absolute units; if the flow sensor is malfunctioning, the gallons reported will represent the measured gallons from the flow sensor. 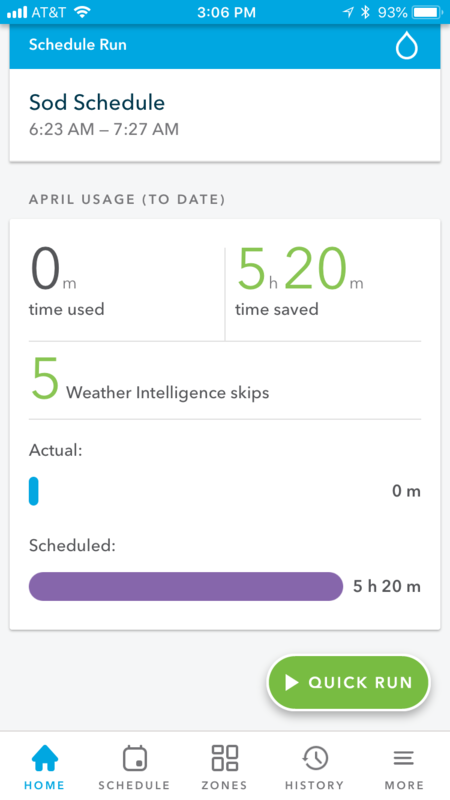 What if my usage reports seem high? If your water usage seems high after connecting a flow sensor, the likely culprit a wiring error or faulty wire. You can follow these steps to debug the issue. This test will require a multi-meter to debug. Set your multimeter to measure resistance. 1) Measure the resistance between the C and SC ports on the controller. If this resistance is below 1k ohms, you have a short circuit between C and SC which needs to be disconnected. 2) Measure the resistance between C and S1 or S2, whichever has your flow sensor connected. If this resistance is below 1k ohms, you have a short circuit between C and S1/2 which needs to be disconnected. 1) Set your multimeter to measure resistance. 2) Measure the resistance between the zone number that’s failing and SC ports on the controller. If this resistance is below 1k ohms, you have a short circuit which needs to be disconnected. 3) Measure the resistance between the zone number that’s failing and S1 or S2, whichever has your flow sensor connected. If this resistance is below 1k ohms, you have a short circuit which needs to be disconnected. Why aren't my drip zones recording flow? High flow notications are currently in beta testing. If you'd like to participate, please sign up using the button below.